He doesn't care one iota when it occurs in Trump's team. But when it came to Bill Clinton's dalliances you couldn't stop this consummate hypocrite from crowing about it. And I suspect a great deal of it is just trolling for an indignant reaction. porter was an unfortunate glitch caught and corrected and I believe porter's ex-wives. he is gone so why is that not an end to it? It would be gone and the end of it if Trump had the guts to say what you just did. But he is a moral coward. But this 4-star Empty Barrel can take it. John Kelly just told reporters he had his "eyes opened" in Sept about the # of officials w interim clearances. So, why did he wait until Feb to issue his memo? It was poor judgment for John Kelly to disclose it. It was also poor judgment for Kelly to tell Tillerson he was fired while he was in the bathroom. It couldn't wait? Well we knew John Kelly was a racist, now we know that John Kelly doesn't even have empathy for high ranking White House cabinet members. Who will have empathy for The Empty Barrel Chief of Staff when they walk him out of those big white White House portico doors? Is this Barrel half- full or half-empty???? 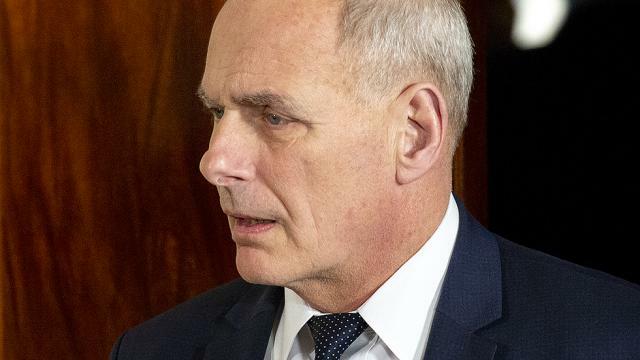 NEW: White House Chief of Staff John Kelly threatened to quit on March 28, according to sources familiar with the events. This 4-star Empty Barrel better be careful about doing that again - - reportedly drumpf is close to taking him up on that. The " president " doesn't like people who say no to him. How many times has Kelly reportedly been on the verge of resigning from the dishonorable Administration? 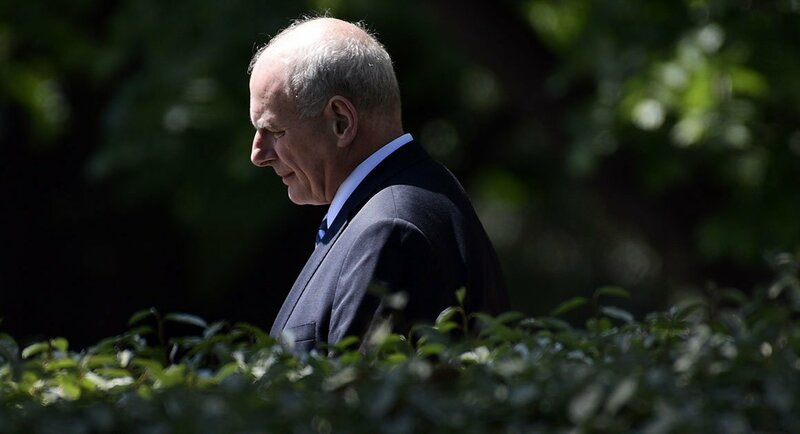 Some current and former officials said they expect Kelly to leave by July, and that Trump and Kelly seem to have tired of each other. To lying about and insulting his boss, the president of the United States. Rumors abound that Sean Hannity will be up for the job of chief of staff, as many sources are saying he's already the de-facto chief of staff anyway. It seems trump feels that this two-year College Dropout can certainly do the same if not a better job than the retired Marine four-star general. 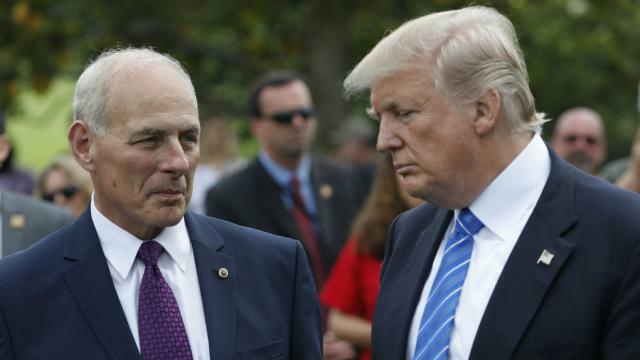 Kelly was Trump's second Chief of Staff after Reince Priebus failed in the job. It looks like the barrel really is empty. Here's John Kelly when asked about AG Sessions' "zero tolerance" policy of prosecuting migrants who cross illegally, with the express intent of separating families. Turns out the barrel wasn't empty at all --it was full of fruit! 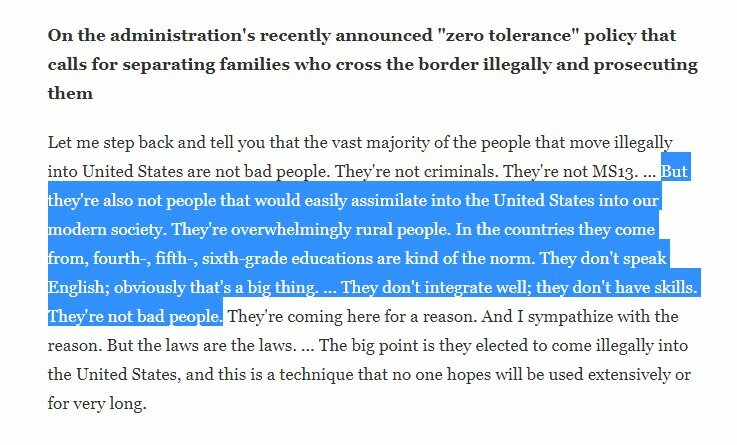 WH Chief of Staff John Kelly thinks he's describing immigrants, but he's literally describing many rural Americans if you dropped them in Boston, New York, Chicago, San Francisco, Dallas, etc. I would like to see actual data that list what percentage of rural Americans have < 6th grade education and don't speak English. Also, if there are so 'many' that just means that the USA doesn't need to add additional ones from other countries. (instead we should put more resources into educating these Americans). I think the real problem in America is native-born Americans who are functionally illiterate. A few years back in Kansas City, they had these hidden storefront places where people could go and learn how to read and write. These places were for ordinary native-born Americans who were ashamed that they were functionally illiterate and wanted to study in Secret. Today public school high school students are graduating from watered down classes that they can pass on their level, which may be 6th grade or thereabouts. And in this day in age in public school - - just about everybody passes unless they drop out. A few years back in Kansas City, they had these hidden storefront places where people could go and learn how to read and write. These places were for ordinary native-born Americans who were ashame that they were functionally illiterate and wanted to study in Secret. Today public school high school students who are graduating from watered own classes that they can pass on their level, which may be 6th grade or thereabouts. And this day in age in public school - - everybody passes unless they drop out. I agree that is a real problem and like I noted additional resources should be applied to help educate these folks. But clearly IF that is 'the real problem' the USA doesn't need to add to it by accepting immigrants (legal ones and especially illegal ones) with low education levels that don't know English. Note that with the Canadian merit system knowing English or French and one's education level are the #1 and #2 criteria used. I agree that a certain level of English should be required for anyone who is going to be considered for citizenship in this day and age. Again, parents will be separated from their children only if as a family they enter the USA illegally. E.g. if as a family they apply for asylum at a border crossing check-point they will NOT be separated. Like everything else that happens to illegal immigrants that people say is cruel or mean: there are consequences to one's actions; if one doesn't like those consequences don't perform the action. I.e. Do NOT try to enter the USA illegally!!!! John Kelly is right. Some families of immigrants do not integrate well into society. In emails obtained by BuzzFeed News through a FOIA lawsuit, John Kelly confirms that his personal email account had been hacked. Apparently the barrel is still empty. 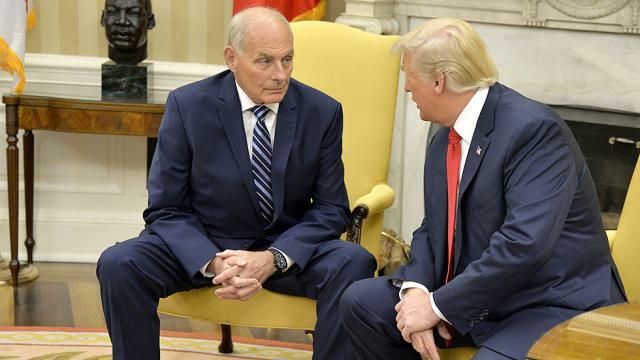 Looks like Empty Barrel Kelly has gotten his belly full of trump. Sources with direct knowledge of the situation have confirmed to me what the WSJfirst reported — that Trump has told people he's interested in Vice President Mike Pence's chief of staff, Nick Ayers, or Budget Director Mick Mulvaney, to replace Kelly. "I got those Hit the Road Jack --Empty Barrel Blues." And Kelly can take his protegé--" I put Latino babies in cages "-- Kirstjen Nielsen with him. 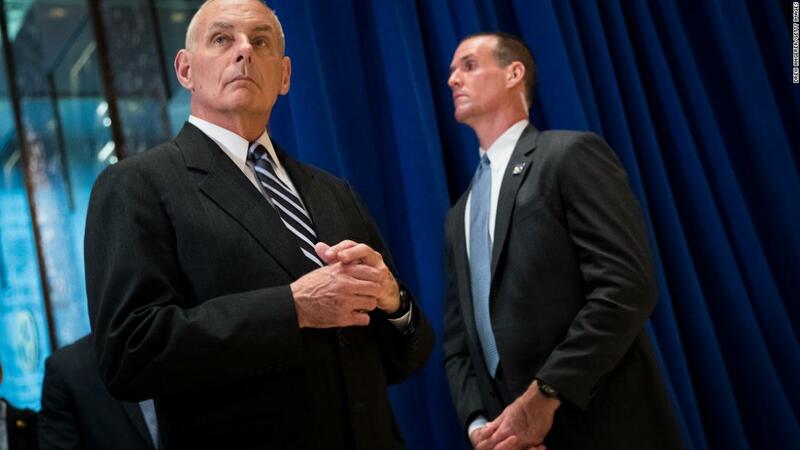 Empty Barrel Kelly shows his real feelings about his boss. And this realistic sinister picture says it all.